The lack of fruitful searches has finally led to what appears to be an orchard. We have narrowed our search down to two locations, Shadow Mountain Ranch and Sunshine Mountain Inn. (Can you tell that we live in the Rockies?) Both of these locations appear to have spots so bright that we've gotta wear shades, satisfying our desire to rent out all cabins (30-45 people), while giving us run of the place. 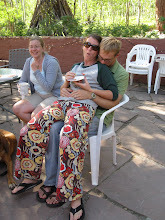 We have previously stayed at the Sunshine Mountain Inn, which was a handsome little husband and wife location on the doorstep to Rocky Mountain National Park, equipped with a relatively small dancing/dining area outside on a stone patio overlooking several mountains. On site is a hot tub, fantastic breakfast spread, fire pit and nicely maintained cabins. It is a promising locale. The Inn maintains a close proximity to the single-lane highway running right by it, giving our guests easy access to other hotels in Estes Park and Lyons, and providing us with eye and ear sores. We are also unsure about the number of people that can comfortably attend our highway-of-love ceremony. Open space is limited and not entirely impressive to the discerning eye. The Shadow Mountain Ranch offers comfortable seating for 150-200 people, which would likely be the number of people attending, and is located right in the heart of ski-country in Winter Park. Though it means a two-hour drive for us and our guests, it provides uninterrupted viewing and listening. The cabins are furnished with modern wares, satellite TV, 80-acres to explore, and massage therapy. And, the Ranch is located to some close-by ethnic eateries. Drawbacks include: the Ranch's distance from Denver International Airport, the fact that it may be up for sale (we found this out through another website), and the fact that the Ranch is not going to be serving breakfast to large groups, though perhaps with some delicate, we-are-renting-out-your-entire-property nudging this can become a reality. We'll know better on Friday when we go to visit. Wish us luck. We had breakfast with a friend this morning, and the conversation inevitably led down Wedding Lane. The cost of her wedding ten years ago? Around $55,000. Her sister's more recent wedding? $300,000. I have to admit I'm a little discouraged already (just after reading the two-page forward of the do-it-yourself wedding guide). The author boasted that her dress "was only $1500" and explained that a bride-to-be should spend no more than $3500 on "partial planning fees." Does anyone else find these exorbitant prices alarming? Why is it culturally acceptable to dump so much money on one event? 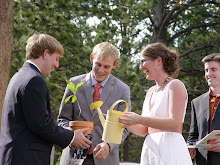 Am I just the Scrooge of weddings? Basking in my own grumpiness and bitterness and refusing to embrace the spirit of the wedding planning season? 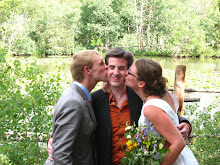 Andy, Matt, and I--a fortified team of three--spent the past 2.5 hours scouring the internet for wedding locations in Colorado (reasonably distanced from the Denver International Airport, of course). Our search turned up the following: Not a Whole Lot. It turns out that our top contender, the Bighorn Mountain Lodge, is actually not what it seems in the pictures. On www.tripadvisor.com, a site for unbiased reviews from travelers, one woman explained, "My aunt had to scrub the bathroom floor and the bathtub before she could let her grandchildren enter." Other glorifying reviews said, "For the 21st century it is hard to believe that this kind of accommodation is still on the market." And, a short but sweet summary: "I wouldn't stay here if it was the last place in town." Matt and I will return to Denver in a few days, after spending our Christmas vacation in Florida. We'll have four days before we start teaching again. Ideally, we'll be able to tour locations and book one for July. Unfortunately, the eight ball is not so optimistic. We're starting to feel pressure from both sides: "If you could just tell us the date..."
Easier said than done. With T-minus seven months to go, we're pretty much at the whim of the location's availability. The "Guide to Planning Family Reunions" recommends booking a location 1 to 2 years in advance. Yipes! We want to be able to spend quality time with our friends and family. We don’t want to follow the traditional pattern of a few wedding “events” where the bride and groom only have time for a “meet and greet”: rehearsal dinner, reception, brunch the following morning. Instead, we would like to be able to rent out an entire bed and breakfast or a group of cottages or a ranch or a lodge, so we can have something more like a family reunion. We want everyone to be able to enjoy nature: hiking trails, a camp-fire, etc. (a lake with canoeing and swimming would be ideal!) at a leisurely pace. We want to find the right balance between comfortable accommodations and not overly-pricy ones. In other words, we don’t want everyone to sleep in bunks, but we also don’t want people to have to spend $200+ for a room every night. We are really trying to stay within a $2,000 budget. I know that sounds nearly impossible for a wedding these days, but it’s important to us to that we don’t waste a lot of money (ours or anyone else’s) on one day. We’d rather have money go towards a honeymoon or a down-payment on our first house. If we can find some place that we can fill up with all of our guests (who will pay for their own rooms), then we would probably be able to use a lot of the facilities without having to pay a whole lot. I really want to dance outside. I’m not sure if that looks like a deck or renting a dance floor or what! I just know that I love dancing under the stars. We’ve talked a lot about location. We initially narrowed it down to Indiana, Florida, Colorado, or Houston. We’re thinking about crossing Florida and Indiana off the list because we’re worried that the wedding might be unbalanced with one set of friends/family, if we hold it in either of our hometowns. That leaves Colorado and Houston, and Colorado is obviously the more desirable place to be in the summer! In terms of the guest list, we’re at a whopping 160 right now! But given the fact that it’s a “destination wedding” since everyone will be traveling from out of town, I’m sure the numbers will dwindle significantly. I also think we could trim some off the guest list if we found the perfect place that couldn’t accommodate that many. I've spent countless hours searching. It's not very fun to spend so many hours doing something that isn't very fun. The perfect place turned out to be not so perfect. They're selling it, and they don't want to book any weddings because their future is uncertain. I guess it's back to the drawing board. Everything we spend that goes toward the wedding gets deducted from our $2000 budget (or should I say our $2000 shackle?). That includes books. And yet books are always a great comfort to me when I undertake new, foreign endeavors (e.g., gardening, sewing, building a co-housing neighborhood). And planning a wedding is definitely a new, foreign endeavor. I mean, how do you even begin to plan an event if you have no idea how many people might or might not attend? And what does a non-drinking couple on a strict budget do about the open bar situation? We trekked to the Denver Public Libray (uphill and in the snow) to procure free books, only to arrive 15 minutes after closing time. So then it was off to our favorite bookstore, the Tattered Cover, where I proceeded to read a wedding book [pretty much] from cover to cover so I wouldn't have to buy it: Priceless Weddings for Under $5000. 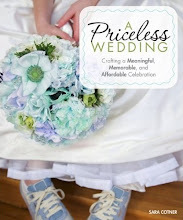 Unfortunately, all the wedding books about "budget weddings" feature budgets more than 100% higher than our own. Even worse, according to the books' titles, we can only get an "elegant" wedding for $5000, instead of a "fabulous" wedding for $10,000. Onto more exciting news: Andy, my best friend and the best internet searcher in the contiguous United States, found a very appealing location option: Black Forest Bed and Breakfast Lodge and Cabins. Matt informed his family we were getting married. I presume they immediately offered to help because Matt replied, "No, no, we want to do it ourselves." He went on to explain that a few of our friends have gotten into serious squabbles with their families over wedding plans. He added, "And in those situations, the people paying for it get to decide. We want to have the control." When he got off the phone, I suggested that we come up with a better PR and marketing plan for this $2000 wedding thing. It's not that we don't want help (in a financial form or in the form of time and energy). It's just that we don't want to spend more than $2000 on one day. Our money or anyone else's. If people feel inclined to throw money our way, we'd rather apply it toward a down-payment on a house or our post-wedding vacation (for some reason, the word "honeymoon" is a bit too sappy for me). So now Matt's mom and I are collaborating on the planning piece. We're trying to secure a location. But she's not quite convinced that a $2000 budget is possible. I hope Matt and I are up for the challenge. It was a gray, Sunday morning. A rarity in Colorado. Matt and I hadn't yet managed to peel ourselves away from the covers. I had my mind on warmer places, "How about a vacation in Belize?" Matt was a bit on the gloomy side, "If we're saving money for a wedding, there's no way we can go to Belize." And then it made perfect sense. Why not have a $2,000 wedding? A thousand from each of us. That would surely leave room for a trip to Belize (and allow us to keep saving for that ominous down payment on our first house). We are grown-ups. We should pay for our own wedding. A wedding is just one day. One day! How can we justify spending thousands and thousands of dollars on one day? So maybe we just have two reasons right now. But they are pretty good reasons.